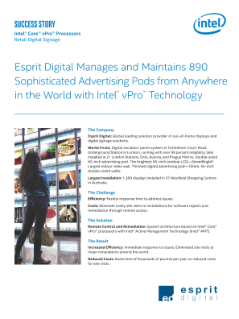 Review this Success Story and discover how Intel® vPro™ technology enables efficient, powerful remote management solutions for companies like Esprit Digital, a UK leader in displays and digital signage technology, to improve point-of-sale performance while reducing costs. GIGAIPC* shares their success stories in integrating intelligence with form factor using Intel® Smart Display Module. xplore the benefits of Intel’s IPC Refresh Program – streamlining the migration process to reduce operating expenditures. Learn about the secure, scalable, and adaptable digital collaboration experience from Intel® IoT Market Ready Solutions. New OpenVINO™ toolkit will make it easier for software developers and data scientists to accelerate their solutions. Watch how Revlis, powered by Intel, is enabling individuals and communities to better safeguard their heath with IoT and AI.